The Hand, aptly described by Aristotle as the "Tool of Tools," was used in many forms as a Talisman against fascination, and similar specimens to Illustration No. 109, Plate VIII have been found in early Etruscan tombs, dating back about 800 B.C. This particular form, the thumb placed between the first and second fingers with the hand clenched and pointing downwards, was considered an infallible protection against all evil influences, particularly against the Evil Eye. Another form was to close the second and third fingers with the thumb and to hold the hand pointing downward with the first and fourth fingers extended, a form which is known in Italy at the present time as making the Devil's Horns. 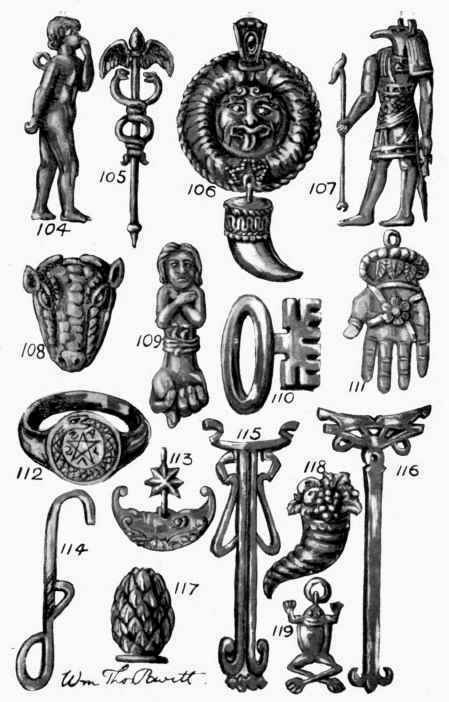 The position of the hand in these ancient Amulets was very important; the open hand denoting Justice and Victory, and in this form sometimes surrounded by a wreath of laurel was used by the Romans as a finial to their standards, and carried in triumphal processions. In the British Museum may be seen a life-sized hand in bronze in the form assumed in the Benediction of the Christian Church, the third and fourth fingers being closed, with thumb and first two fingers extended; this form has its efficacy as a Talisman against the Evil Eye increased by numerous other symbols (already dealt with), a pine cone being balanced on the finger-tips, a serpent running along the whole length of the back of the hand and towering above the third finger; and, amongst others, the Asp, Lizard, Caduceus, Frog, and Scales may be seen, all probably connected with the worship of Isis and Serapis. This form, known as Mano Pantea, and the life-sized hands were kept in the house as Talismans to protect it against every evil influence of magic and of the Evil Eye, whilst small replicas were worn as Amulets for personal protection. ETRUSCAN, GREEK, ROMAN, AND ORIENTAL TALISMANS. The Lizard And The Tortoise were symbols of Mercury, and the Caduceus is frequently depicted placed between them on ancient Talismans. The Lizard is also to be found engraved on many of the old Roman rings, and was used as charm against weak eyesight, the brilliant green of its body, like the Emerald, causing it to be held in high esteem, both spiritually and physically. It was a type of the Logos, or "Divine Wisdom," and was placed upon the breast of Minerva, as frequently seen on ancient engraved gems. It is also found in Portugal made of painted porcelain and affixed to the walls of houses to attract Good Fortune. The Spider, like the Lizard, was sacred to Mercury and was considered a most fortunate symbol engraved on precious stones, its remarkable quickness of sight recommending it as a Talisman for shrewdness in business matters and foresight generally; and according to an old writer, prognostications were made from the manner of weaving spiders' webs, and it was deemed a sign that a man would receive money if a little spider fell upon his clothes. The Eagle was typical of Jupiter because it predominates over birds of highest flight, and it was worn as a Talisman for Dignity, quickness of Perception, and the Favour of those who sit in high places. Marcellus Empiricus prescribes the wearing of a ring as a preservative from Colic and Watery Diseases. This Talisman was made of gold thread melted down and engraved with the figure of a fish; such a ring exists in the Florentine Cabinet and may be seen at the present day. Snails were also used in love divinations by the Ancient Romans: they were set to crawl upon the hearth and were thought to trace in the ashes the initials of the lover's name.